Looking for craft fair tablecloth ideas? Craft fair table covers are one of the best places to really make a statement with your booth design. The right ones can draw the eye of shoppers and be used to highlight your products simultaneously. Check out the excellent examples of table covers below. You can buy them, but it’s even better if you can make them yourself and have them reflect your unique style. *Hint* In most cases, you’ll want to avoid busy patterns on table tops so they don’t drown out your product, but a bright, fun table skirt with a solid cover or subtle pattern makes for a great display! This DIY table cover from ruffled rags is really adorable and quite simple to do. Take strips of contrasting cloth to do the strips. Another benefit to this cover is if it gets tattered a bit from wear and tear, who will really notice? With the right colors to highlight your products, this would be cute, eye catching and pretty low maintenance. No ironing, starching, excessive washing etc. This one comes from a birthday party site, but that doesn’t make the idea less valid. I love the three tiered skirt. Imagine doing this on just your front and center table – how pretty and if you can sew simple ruffles, probably not all that difficult to do. Grab some bulk fabric in 3 shades that look good together and coordinate well with your items. This quilted reversible table cover from quilted cupcake design is absolutely adorable. The directions are simple and you could use fabric scraps or even purchase discount fabrics or closeouts to create something similar. I love this idea. Beware not to use patterns that are so vibrant and busy that they take away from your actual product display though. Another benefit to this? Extra time between washings, simply flip it over. Here is another cute DIY idea with doilies sewn onto a linen tablecloth. I imagine this would be cute with different colored fabrics as well. Very eye catching. This adorable vintage Paris table cover and others like it are very inexpensive on AliExpress.com They sell many vintage looking table cloths perfect for anyone who designs vintage inspired items or does paper crafts. Put this on top of a pretty table skirt, or even use it as a backdrop behind a solid table cover. 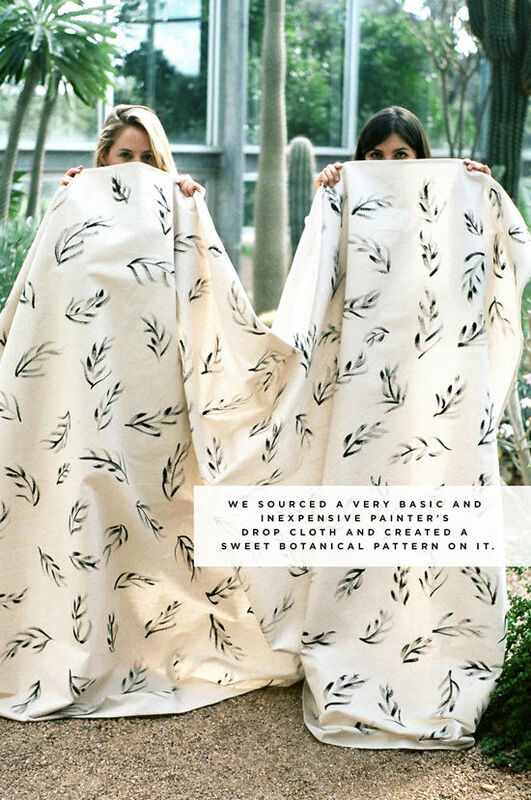 Check out this really awesome drop cloth that these ladies painted. Canvas drop cloths are inexpensive – heavy canvas ones run around $12. Paint or iron on your logo, a pattern, or whatever your heart desires. You might also want to dye fabrics. Tie dye or scrunch dye cotton in colors of your choice. If you keep the patterning subtle you won’t have to worry about detracting from your products, but will still have a very vibrant table covering that is sure to get noticed. Be sure you use only natural fabrics when dying. 100% cotton fabric works best. Synthetic fibers don’t take or hold dye well. Click the image to be taken to a very detailed tutorial on how to get this type of result. Very Pretty! SO, hopefully you have some great ideas and inspirations now for creating table covers that will make your booth rock. If you have other ideas to share or want me to share your custom created table ideas be sure to comment below. If you’re looking for free patterns All Free Sewing has you covered with 14 patterns and tutorials. No time to create your own? You can buy trade show table covers cheap on Amazon.